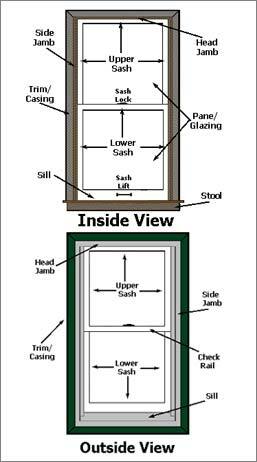 The amount of exposed, clear glass, along with the brand of the window, can tell us what size you need in order to order the proper replacement wood sash for your window. 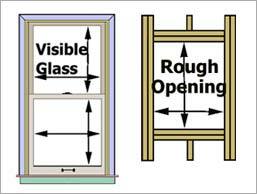 One way to measure when replacing a window is Visible Glass (see right). The amount of exposed, clear glass, along with the brand of the window, can tell us what size you need in order to order the proper replacement wood sash for your window. The other, and relatively more reliable way, is to measure the rough opening (see right). This is the hole in the framing made to take the window. If you are building a new home, this can be made as large or small as it needs to be (depending on your design and the insulation rating for your walls). With a rough opening, the brand of the window is completely up to you, as most manufacturers make a variety of sizes, at least one of which should come close to the size you want. If you are looking for a specific part for your window, often the brand of the window is the most important thing you can find out. Once you know the brand, we can go on and try to find and order the part for you.